The constellation of Cepheus has a plethora of beautiful dark, bright, and reflection nebulae. One of the highlights of the constellation is NGC 7023 - the Iris Nebula. In this image, this beautiful reflection nebula is in the upper left. Throughout the remainder of the astrophoto are numerous bright and dark nebulae. The most prominent of the bright nebulae is the arrow shaped nebula on the right side - LBN 468. 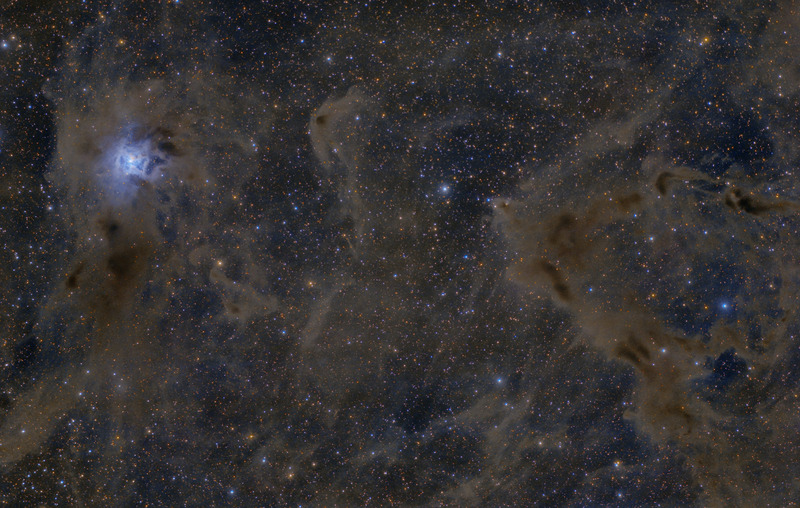 To help envision how many different nebulae designations there are in this image, consider that just the dark nebulae embedded within LBN 468 include LDN 1147, 1152, 1155, 1157, and 1158. While the Iris Nebula and LBN 468 steal the show in this image, arguably the most fascinating object in the photo is also one of the smallest. Close inspection of the the tip of the arrow of LBN 468 will reveal an object resembling a comet. This is the Herbig-Haro object known as HH 215 or Gyulbudaghian's Nebula. The nebula is a high speed jet streaming from the variable protostar, PV Cephei. Much like Hubble's Variable Nebula, Gyulbudaghian's Nebula varies in brightness in shape as the progenitor star brightens and darkens. In this image, North up. This image is cropped to 93% of the original image. Software Used Images Plus 5.75 for camera control. Images Plus 6.0 Beta for calibration, stacking, digital development, feature mask, star shrinking and halo reduction, smoothing and noise reduction. Photoshop CS5 used for levels and curves, high pass filter, star shrinking, screen mask invert, lab color, vibrance, saturation adjustments, lens correction, cropping and selective color. HLVG for additional color correction, Gradient Xterminator for gradient removal. Carboni Tools for additional noise reduction and smoothing, Focus Magic for focus restoration. Registar for stack alignment. Notes As this is my second light image with the Nikkor 600mm lens, I was very excited at how well I was able to capture all the faint nebulosity in this image. At the time I captured this data, the Astro-Physics focuser was not well collimated with the lens. The net result was that I had some coma and chromatic aberration in the data. Fortunately, the lens is inherently sharp enough that I was still able to capture some quality data, and I was able to compensate for most of optical misalignment using Photoshop's lens correction filter. I am very pleased with the color in this image as well as the overall look. It makes me very hopeful that the Nikkor 600mm lens will be quite a performer now that I've been able to correct the focuser misalignment problems. This image was published by Astronomy Magazine as its Picture of the Day for January 6, 2015! This image won Astrophotogallery.org's Medium-Nebula category for September 2014.